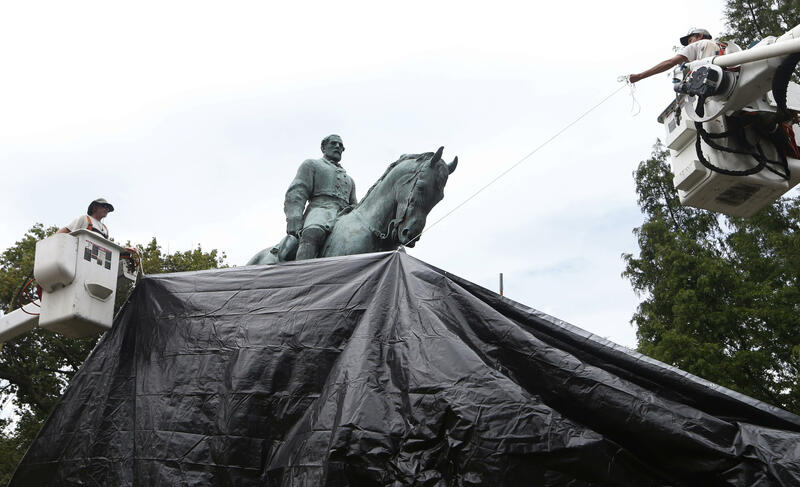 CHARLOTTESVILLE, Va. -- Workers in Charlottesville draped giant black covers over two statues of Confederate generals on Wednesday to symbolize the city's mourning for a woman killed while protesting a white nationalist rally. The city council voted to shroud the statues early Tuesday, at the end of a hourslong meeting packed with irate residents who screamed and cursed at councilors over the city's response to the Aug. 12 rally, dubbed "Unite the Right." City council member Kristin Szakos told CBS affiliate WCAV the decision to cover the statues does not violate a court injunction issued in May preventing the city from removing them. "We can't build something. We can't do anything concrete to the statue itself," Szakos said. "But shrouding it in cloth doesn't disturb the statue. It doesn't hurt the statue and it expresses our community's real mourning." On Wednesday afternoon, a man who identified himself as John Miska apparently tried to remove a portion of the tarp by cutting through it. Video of the incident was posted on social media. Miska was asked to stop cutting by the police and he complied. According to local media, a gun was strapped to his leg. During a Facebook Live video stream by The Daily Progress newspaper, the man can be heard saying, "Why do they let a screaming minority dictate what we can and cannot see in this city?" That video stream also showed police presence at the scene. He pleaded that there should be "open, honest discourse" in Charlottesville, and started to argue with others at the park. The Aug. 12 demonstration was believed to be the largest gathering of white nationalists in a decade. Neo-Nazis, KKK members, skinhead and members of various white nationalist factions clashed violently with counter-protesters in the street adjacent to Emancipation Park. The fighting went on largely uninterrupted by authorities until the event was declared an unlawful assembly and the crowd was forced to disperse. Later, a car rammed into a crowd of counter-protesters, killing 32-year-old Heather Heyer and injuring more than two dozen others. The man who police say was driving, James Alex Fields Jr., has been charged in her death. The death toll for the day climbed to three when a police helicopter that had been monitoring the protest and assisting with the governor's motorcade crashed, killing two state troopers. The white nationalist rally was sparked by the city council's vote earlier this year to take down the Lee statue. That decision is in the midst of a legal challenge, and a judge has issued an injunction preventing the city from removing the Lee statue while the lawsuit plays out. A hearing in the case is scheduled for September 1. In other developments Wednesday, , a white nationalist from New Hampshire who took part in the Charlottesville demonstration, was expected to turn himself in on three felony charges. Contacted by The Associated Press, Cantwell acknowledged he had pepper-sprayed a counter-demonstrator during an Aug. 11 protest on the campus of the University of Virginia. But he insisted he was defending himself, saying he did it "because my only other option was knocking out his teeth."